Fair trade…organic…kosher… Surely all these organization wouldn’t put their seal of approval on an underwhelming tea, right? It’s been a while since we looked at Trader Joe’s tea selection. And honestly, that’s because Trader Joe’s teas run a little hot and cold. On the one hand I’m a huge fan of Trader Joe’s Spiced Chai Tea and their Autumn Harvest blend. On the other hand you have more, shall we say, lackluster offerings like their wretched Tropical Sweetened Matcha. 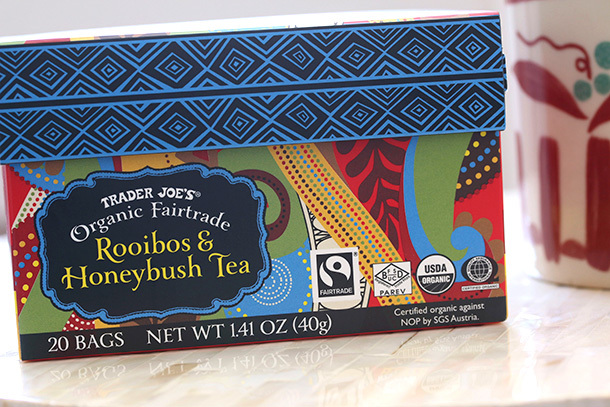 When I saw the new gorgeous box of Trader Joe’s Fair Trade Organic Rooibos and Honeybush Tea, I was immediately on board. Surely with box art this bold, this dynamic, surely it must be one of the good teas. Right? Look, let’s start out with the positive stuff. Fair trade products are worth supporting. As it turns out, corporations are incredibly good at exploiting the unrepresented and voiceless – particularly if the people being exploited are a continent or two away from the eventual consumer. In the same way that fair trade chocolate is important to developing sustainable economies (and environments) in Africa, fair trade tea is worth supporting. Also it’s organic, so that’s good too. Organic and Fairtrade – two strong, good adjectives leading us off right out the gate.The problem is that the product title doesn’t’ stop there, because then we get to the “rooibos” part. I don’t do this often on this blog, but I’m going to make some strident, potentially divisive claims based more on personal opinion then objective polls of larger social trends. Rooibos tea is terrible. In the same way that people have risen to the defense of Trader Joe’s heavily sweetened corn-only salsa, I’m sure there are die-hard rooibos tea lovers who are going to take umbrage with this statement. To me however, rooibos tea taste like wet carboard. That was the first thought I had the first time I tried it, and it is the same thought I have had every time since. Rooibos tea tastes exactly like sucking on the paper stick of a Tootsie Roll Pop until it turns to mush. Rooibos is an herbal tea, which means it isn’t a real tea made from the leaves of tea plants, but instead from the clippings of a broom-like scrub plant that grows in South Africa. It has been steadily growing in popularity the last few years because of…. something. I don’t know. I honestly do not understand why people drink this tea, and I have regretted the purchase every time I picked it up. I had hopes that the promise of “Honeybush” being present in this Rooibos and Honeybush tea might make for a different experience. It does not. Honeybush is another South African bush commonly said to taste just like the rooibos bush only “a little sweeter”. “Little” being the important adjective in this phrase, meaning “not actually noticeably sweet at all”. Here’s the other thing I think is weird. It takes an incredible amount of rooibos to brew even a single cup of rooibos tea. The given brewing instructions are to let one tea bag steep in your cup for 6 full minutes before you try sipping it. For a pot of tea they recommend adding one tea bag per person, and letting the pot steep for 8 minutes. That’s an extremely long soak. I dare you to try that with a bag of Trader Joe’s Original Irish Breakfast Tea, let alone several bags. After 6 minutes, the tea would be strong enough to overpower you in fight. Again, yes the box is beautiful, the bags are beautiful, and even the box itself is well designed – incorporating a natural hinge and an exceptionally clever self-locking flap. The only problem is that I feel I would be just as well off gumming the edge of the box until it turns to pulp as I would be actually brewing the contents. I may be well off the mark on this one – I’m willing to believe that someone loves this tea – it’s just that it it has any positive qualities I’m completely blind to them. Would I Recommend It: This is very unlikely. Would I Buy It Again: I don’t think so. If I get the hankering for rooibos again I reckon I can always just chew on an index card. Final Synopsis: Rooibos tea always tastes like wet cardboard to me. I bought it because it had Rooibus in it. I agree it was a long time to brew, but it was strong and I enjoyed it. Love your entertaining review even if I have to politely disagree. It’s actually the first rooibos tea I DO like! So what I actually like may be honeybush tea with a touch of soggy tootsie roll stick. But with a drop or two of TJ’s liquid stevia this blend has nearly replaced my caffeine-laden cuppa jo habit. I agree, the brewing time is long. But I carry my cup around for an hour anyway, injesting it as a slow drip instead of drinking it outright–which may be another reason I like it! lol Sorry you were disappointed. Oh man I just bought this! I’m so glad I found your blog!! Ps, I didn’t see TJs vegetable Samosas! Not bad. I had my first taste of this tea a couple of nights ago and I really enjoyed it. It’s not bitter, nor does it need any sweeteners, it’s good as is. I really like it and will purchase it again, but people have different tastes, so I guess it’s not your cuppa tea. I too usually have nothing but positive comments when it comes to Traders Joe’s tea but this particularly flavor makes me think of steeping a sweaty gym sock in hot water for five minutes. I almost didn’t taste it because the smell was offputting. I, like you, was intrigued by Fair Trade and the colorful box but alas, they were the only positives. Fun review! To each there very own–my preface to saying that this exact tea has actually become my favorite! I drink it hot and iced. Love it both ways. I find the earthiness so refreshing. No tannins. I went through one box in less than 2 weeks. I also couldn’t bring myself to eat cheese for the first 20 years of my life. Ha! Again, to each there own. Cool post, do you mind if I link to it from my new blog/tea shop? I like—no, love this tea and miss it since TJ discontinued it. But the reason, I was told, is that it’s not popular enough to warrant keeping it. So I guess others may share your opinion.